Located 2 miles north east of Chipping Campden. The location of the famous Hidcote Manor Gardens. Hamlet nestling beneath the Cotswold edge with several pleasant farmhouses and cottages. There are public paths from here to the villages of Buckland and Stanton, and a nice bridleway up the hill linking onto the Cotswolds Way Walk and going beyond to Snowshill. This beautiful secluded village nestles beneath the Cotswolds escarpment at the foot of Burhill. It is thought to have the oldest rectory in England, with an impressive timbered hall that dates from the fifteenth century. John Wesley preached in the church of St. Michael, the east window of which contains some splendid 15th-century glass, judged by some to be the nicest in the Cotswolds, and reputed to have come from Hailes Abbey at the Dissolution. William Morris attended church services here when he came to Buckland in the 19th-century and was so impressed by the glass that he personally paid for its releading. 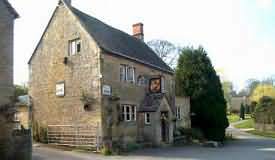 Located in Gloucestershire 1.5 miles north-east of Bourton-on-the-Water. There are three Rissington villages about a mile apart on the eastern side of the Dikler and Windrush valleys. Wyck Rissington is the more northerly and is an unspoilt little village with a wide rough green complete with victorian drinking fountain. There are several attractive houses and cottages, the most pleasing of which is a substantial farmhouse fronting onto a well stocked duckpond. The church of St Lawrence has a squat 13th-century tower and a chancel of the same period with two unusual lancet windows at its east end. The famous composer, Gustav Holst, was organist here in 1892 at the early age of seventeen. Located in Gloucestershire 4.5 miles north west of Cirencester. At this tiny hamlet the Dun Brook flows through a clear and shallow ford that almost laps the doorsteps of the farm and cottages. The hamlet of Duntisbourne Leer once belonged to the Abbey of Lire in Normandy, France until 1416, when it was given to Cirencester Abbey. Located in Gloucestershire 4 miles north of Lechlade. The villages of Eastleach Martin and Eastleach Turville are situated on opposite banks of the River Leach connected by an old stone 'clapper' footbridge known as Keble's Bridge. Here are two parish churches looking at each other across the clear waters of the little river. Today Turville is by far the larger settlement but Martin has the larger church. Located in Gloucestershire 3 miles west of Burford. The village of little Barrington was the home of the Strong family who were master masons and suppliers of limestone for some of the finest houses in the Cotswolds. Thomas Strong under the direction of Christopher Wren laid the foundation stone to St. Pauls Cathedral in London. The stone for the village came from a large depression nearby where a small stream wells up. The village cottages form a large oval around the rim of the depression broken only by the road running through. Located in Oxfordshire 1 mile north east of Lechlade. Little Faringdon is a small village abutting Lechlade in Oxfordshire. St Margaret's Church at Little Faringdon is a small mostly Norman church with the addition of a modern bellcote on the west end. The chancel still has the original Norman billet corbel-table and round headed lancets of a same date in both side walls. A similar window is visible in the west wall of the nave. The model Kate Moss lives at Little Farringdon in a 10 bedroom house. This small quaint village overlooks the valley through which the little River Dikler runs. This is crossed by a small 18th-century bridge above which is a moss-covered weir retaining an extensive mill pool for the 19th-century mill. The village is grouped around the manor house and church. There are an unusually high number of prehistoric barrows in the area. This delightful village is sited above the Windrush meadows and has a small triangular green around which are several pleasant houses and cottages. The village is named after the River Windrush which is the largest of the Cotswold rivers and clings to a steep slope above the valley where the river runs. The church of St Peter commands the highest ground and its impressive south doorway is Norman featuring a double row of fantastic, beak-headed demons with strange staring eyes - warning the worshipper that he who hesitates in crossing the portal is lost! In the church yard there are magnificent 'bale-tombs'. Broadwell is a pleasant village spread around a wide green and sheltering beneath a hillside rising up towards Stow-on-the-Wold. 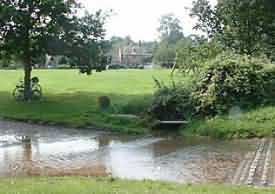 The green is overlooked by the hospitable Fox Inn and there is a small ford at its lower end (see pictures below). Beyond the green is a handsome Georgian manor house and there are several 17th century farmhouses nearby. Broadwell has a broad village green ringed by lovely Cotswold stone cottages, a gentle stream running through the village, a popular inn, and a Norman church with some intriguing historical monuments. Broadwell is mentioned in the Domesday Book of 1086. At that time it had 46 inhabitants, and the church of St Paul dates in part to that period. During the later Middle Ages the estate belonged to the Benedictine order of monks. The large village green was donated to the village by Lord Ashton in the late 20th century. Beside the green runs a gentle stream, a tributary of the Evenlode. Broadwell Hill estate was bought in 1929 by Lord Ashton of Hyde, who in 1960 owned over 300 acres. In the parish. Lord Ashton (former director of Barclays Bank) married, in 1957, Pauline Trewlove Brackenbury, whom he met at a dance at Sezincote, the Gloucestershire home of the Kleinwort banking family.